The brisk flavor of horseradish créme fraîche and cool cucumber make an excellent backdrop for the mussels’ smoky flavor. Use deli smoked mussels (sold in bulk or sealed packages in the deli), not canned. Canned smoked mussels are overpowering here. 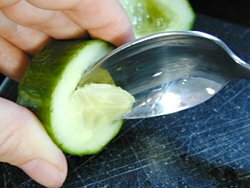 Scoop out seeds from the slice, leaving half of them intact, to form a little bowl. Cut the larger mussles in half; leave tiny ones whole. Combine créme fraîche, horseradish & onion. (For a thicker dressing, you can squeeze some of the water out of the horseradish, but I just used it as-is from the jar. You could also use fresh horseradish.) Toss with mussels. 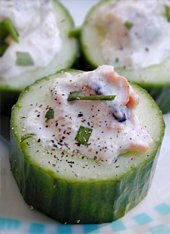 Place one mussel or mussel half in the “bowl” of each cucumber slice. Dress with chives, salt & pepper. This entry was posted on Wednesday, September 5th, 2007 at 8:07 pm	and is filed under Appetizers, Carnivore, Master Recipe Index, Party Food & Snacks, Speed Queen (30 min/less), Vegetables. You can follow any responses to this entry through the RSS 2.0 feed. You can leave a response, or trackback from your own site.